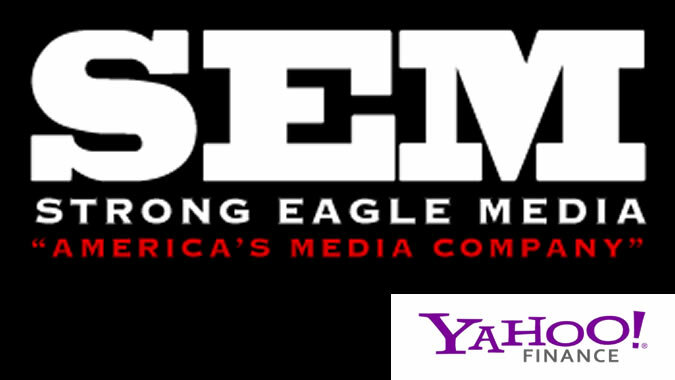 YAHOO Finance — PRODUCERS BEHIND THE CRITICALLY ACCLAIMED HIT FILM THE HORNET’S NEST, FORM NEW COMPANY, STRONG EAGLE MEDIA. Serial entrepreneur Bert Bedrosian who is known for creating a number of successful global brands including the origination of MTV’s first licensed product and worldwide branding and licensing division, as well as an owner and financier of Tapout, the world’s most popular MMA lifestyle brand is joining forces with acclaimed Producers David Salzberg and Christian Tureaud (The Hornet’s Nest, The Perfect Game) to form a new, vertically integrated production and digital media company STRONG EAGLE MEDIA. In addition to producing inspirational all-American military stories, STRONG EAGLE MEDIA will produce and release a slate of high quality film, television and digital media properties. Similar to The Hornet’s Nest, the military projects will chronicle the journeys of some of the most daring and dangerous missions in U.S. military history. These films will utilize unprecedented footage creating an immersive experience that will provide viewers with a perspective as close to being on the front lines of battle as anyone has ever seen. John Brenkus’s ten-time Emmy Award winning company BASE Productions will serve as co-production partners on STRONG EAGLE MEDIA’s military film projects. STRONG EAGLE MEDIA will have 5 primary areas of focus: Military, Sports, Action Adventure, Original Television Series and Digital Networks that will cover a wide variety of subject matter. Bedrosian, Salzberg and Tureaud last joined forces in the critically acclaimed theatrically released and top selling DVD of 2014 The Hornet’s Nest. The Hornet’s Nest made history as the only film to ever to be enshrined into the National Infantry Museum at Ft. Benning, GA. This critically acclaimed film qualified for the 2014 Academy Awards and has been embraced by critics across the country. The Hornet’s Nest is one of the most successful and best selling military films of all-time and is ranked #2 out of 3,263 on IMDB in its genre. STRONG EAGLE MEDIA is also announcing today that it has already begun production on its next two films in its Military Hero Series. Both films are fully funded, have worldwide distribution in place and are slated for 2016 release. Prior to The Hornet’s Nest, Bedrosian, Salzberg and Tureaud collaborated on the 2010 theatrically released hit feature film The Perfect Game starring Clifton Collins Jr., Cheech Marin, Jake T Austin and Moises Arias. Commented Bert Bedrosian: “Christian, David and I have worked together on several films and business endeavors through the years and following the success of The Hornet’s Nest it felt right to take our relationship to the next level and create a new brand, a global footprint that will have impact for generations to come. We are excited about the future of our traditional and digital properties. We have already positioned Strong Eagle Media to be at the forefront of the two trillion dollar fight for the living room with regard to our new digital assets. The timing is now perfect for us to deploy our digital networks and unique original content. Industry analysts predict this market will be larger than the worlds eight largest market cap companies combined, these companies include Apple, IBM, Exxon Mobile, and Berkshire Hathaway to name a few”.